For the past 18 years, Daniel has dedicated himself to Early Childhood Education with a goal to instill confidence and happiness in each child, while creating awareness about the joy of parenting. Daniel has been a part of the Little Dolphins community for the past decade and a half, maintaining various key roles both inside and outside the classroom. Those experiences along with his time directing programs and consulting abroad, his proficiency with coaching parents, and his skilled and passionate focus on the social-emotional development of children will prove to be vital under his leadership as Director. Daniel believes in the importance of valuing each member of the community through communication and collaboration and believes in the idea that the collection can only be considered successful if each member of it is valued. He has learned through Little Dolphins the philosophy found in southern Africa entitled Ubuntu: I am because we are; we are because I am. Daniel has been influenced in his life by various educational and social thinkers, including Howard Gardener’s Multiple Intelligences, to Piaget’s child development focus, to the likes of Einstein, Mandela and Gandhi on how they placed value on the individuals within a society. 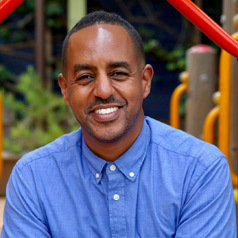 With each of these influences, along with years of experience in the field of Early Childhood Education, Daniel and the Little Dolphins faculty and staff have begun to implant their fingerprint on the ECE landscape in Los Angeles. After time abroad, Daniel is once again excited to have returned to Little Dolphins and thrilled to dedicate himself to serving as a liaison among the Administration, children, and parents – always with the intention of upholding curriculum and community. Daniel is a huge music lover, an avid sports and Lakers fan, and plays basketball with dads from Little Dolphins and Palisades once a week! Along with running Little Dolphins, Daniel serves as Vice Chair on the Board for California Charter Collegiate School, located in South Los Angeles, right where he was born and raised. He looks forward to expanding his vision of supporting children and their families at Little Dolphins and the greater Westside community.